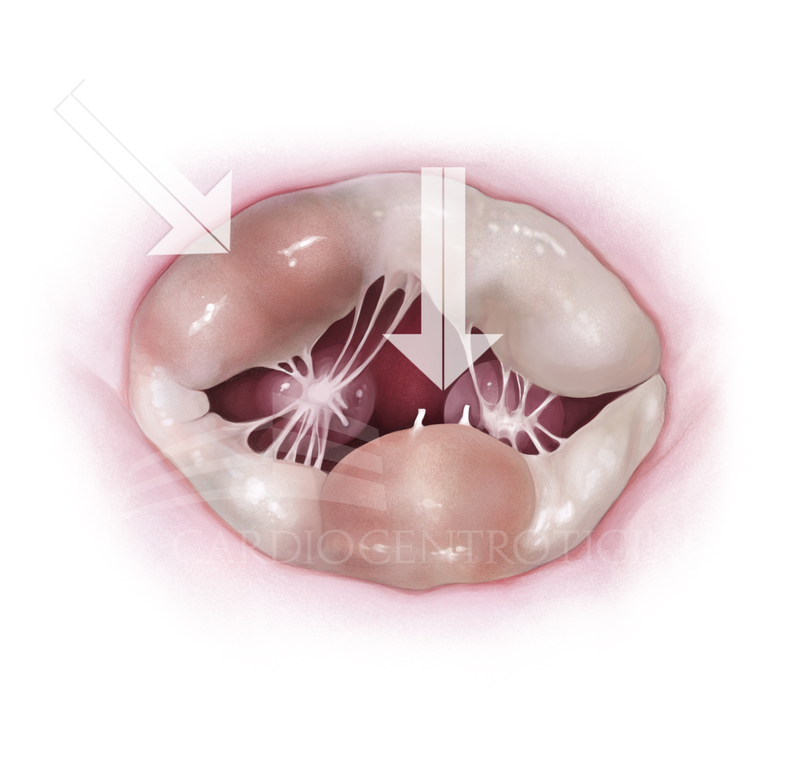 Our preferred approach to the mitral valve is the right-sided mini-thoracotomy (Fig. 8). This applies to almost all patients with degenerative mitral regurgitation. As an alternative, in presence of contraindications to the right mini-thoracotomy, an inferior mini – sternotomy can be applied. The aim of surgery in all patients with degenerative mitral regurgitation is mitral valve repair. 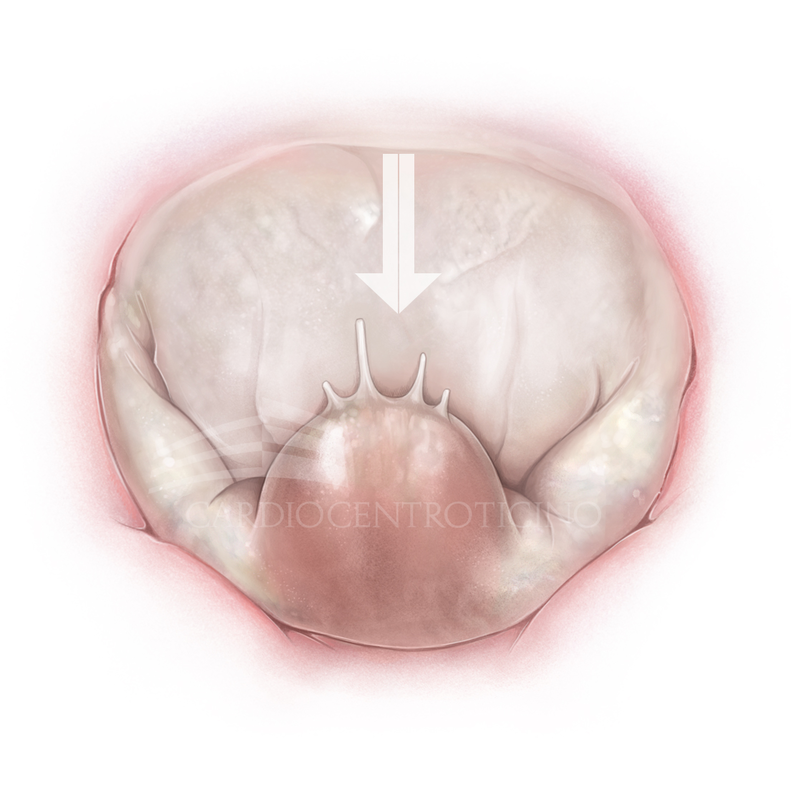 We have a wide choice of repair techniques of the mitral valve leaflets (artificial chords, various tissue resection techniques, edge-to-edge fixation), as well as for the valve ring (various prosthetic bands or rings), we choose the combination of the best suitable techniques for the given individual anatomy. A. Mitral valve repair (prolaps of the posterior leaflet): triangular and butterfly rersection, annuloplasty. B. Mitral valve repair (bi-leaflet prolaps): implantation of artificial chords to both leaflets (Goretex), annuloplasty. Our “successful repair rate” for degenerative mitral valve regurgitation is beyond 95% and in more than 80% of patients with minimally invasive techniques. For mitral valves affected by rheumatic disease (rheumatic fever in young age) surgical treatment consists most most frequently of mitral valve replacement with either a mechanical or biological prosthesis. Many aspects of those valves require special attention, such as the degree of calcification of the mitral annulus. In selected cases sometimes the implantation of a TAVI prosthesis under conditions of open heart surgery is the only solution currently available. In any case, we evaluate carefully the specific condition and anatomy of each patient in order to propose a highly individualized operation. Surgical options for the so called “functional mitral valve diseases” are both valve repair and replacement. Recent research suggests replacement as the most reliable and durable option if surgery is indicated. There is, however, a less invasive alternative, which is also offered at the CCT by our colleagues of the Interventional Cardiology: the percutaneously applicable MitraClip procedure. As with indications for treatment of the aortic valve, indications for treatment of the mitral valve are discussed and decided within the regular meetings of the interdisciplinary Heart Team.